"It doesn't matter if we all die." So goes the baleful howl of one of the most tribally terrifying songs in the entire Cure catalogue, "A Hundred Years." And of course, it's an apocalyptic aphorism. After all, we all do die eventually, and while it matters on an intimate scale, in the wider picture of things, our individual deaths just kind of all mesh together, and become like static on a TV screen. But the movie in question is not called "Mort." 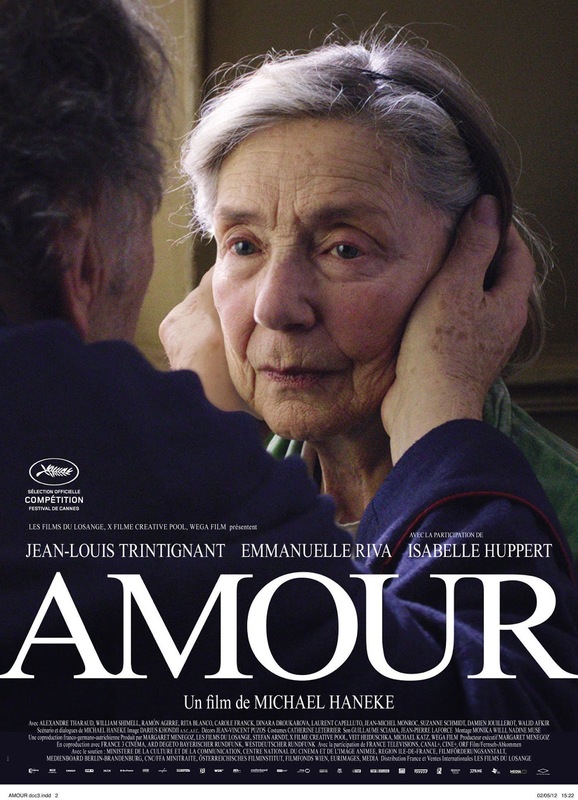 It's called "Amour" and as such, must be more about love than death, right? Or are the two inseparable, as suggested by Woody Allen's satirical film, "Love and Death"? Apparently love is made more meaningful by death, or death more poignant by love, or some such hackneyed pronouncement that also happens to resound with Terrible Truth. A movie about an elderly couple who are growing old gracefully until one of them begins to face imminent death and the other becomes the caretaker is not supposed to have any slivers of hope in it, right? 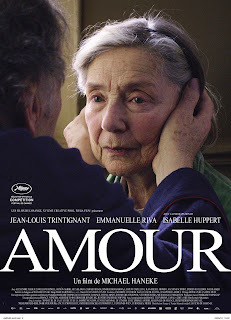 And yet somehow, "Amour" is life-affirming, or at least not life-negating. But that's not because the film is idealized or glamorized in generic fashion, but rather because it's told in a stark, blunt style reminiscent of documentary mode. The director, Michael Haneke, does not fill in the blanks for us at every turn, but lets nuance do the talking. Details would clutter the story, which at its core is about dying with dignity. I expected to be encumbered with draining depression upon seeing this film, but instead of crushing angst, I felt liberated, existentially. 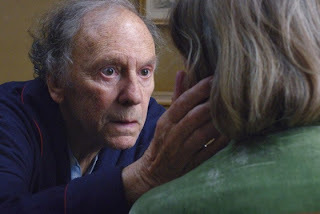 Not that there is not some ugly, wrenching content in the film, which is acted with aching verisimilitude by legendary French actors Emmanuelle Riva and Jean-Louis Xavier Trintignant. This is not a film for the faint of heart, or for those nourished on a diet of timid, distilled Hollywood cinema. So even though Dylan Thomas exhorts us to rage against the dying of the light, in the end we are captive to death's cruel whims, and we must attempt to face them with honor and humanity rather than resigned shame.